Minister of Infrastructure and Communities Amarjeet Sohi, left, and Kinder Morgan Canada president Ian Anderson, make their way to a ground breaking ceremony at the Trans Mountain stockpile site in Edmonton Alta, on July 27, 2018. Given the uncertainties about North American trade measures under U.S. President Donald Trump, trade and energy experts this week flagged U.S. State Department rules that the government must be notified when ownership of a cross-border pipeline changes hands. The Trans Mountain system that Ottawa wants to buy from Kinder Morgan Canada Ltd. includes the Puget Sound pipeline, a 111-kilometre line that can carry as much as 180,000 barrels a day of crude from Alberta to refineries in Washington State. The federal government’s acquisition of the Puget Sound line must be reported both to the U.S. State Department and to the Committee on Foreign Investment in the United States, a group under the U.S. Treasury Department that examines foreign takeovers for national-security implications. “As we have stated in our dispute with the U.S. on tariffs and on NAFTA, Canada is not a security threat to the United States, and even to think that Canada can be is just inconceivable,” Mr. Sohi said in response to reporters’ question on the U.S. review at an Enoch Cree Nation event west of Edmonton on Friday. However, the Trump administration continues to call Canada a national-security threat in justifying its imposition of steep tariffs on Canadian steel. That position is viewed by many as a negotiating tactic on the part of the United States as it seeks a dominant position in talks on a revamped North American free-trade agreement. U.S. Trade Representative Robert Lighthizer said this week that the tariffs on steel and aluminum would be lifted if Canada, Mexico and the United States agreed to a new NAFTA deal. Given this trade climate, there are fears that the American review for the Trans Mountain sale could also be used to give the United States leverage in trade talks. But Mr. Sohi, along with Alberta Premier Rachel Notley and Kinder Morgan Canada president Ian Anderson, all indicated on Friday that they don’t anticipate any surprises in the continuing U.S. review process. 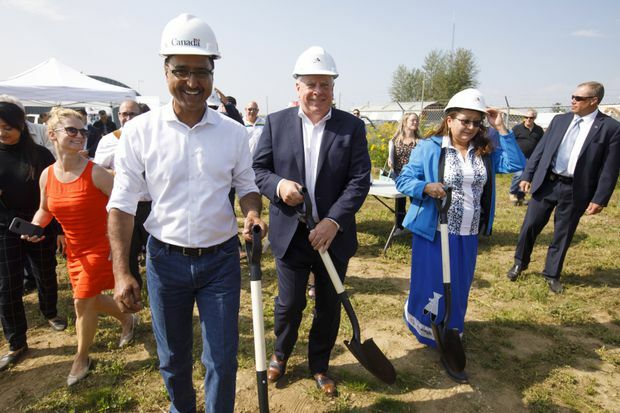 The politicians joined Enoch Cree Nation Chief Bill Morin in a special ceremony on Friday to open a site that will store materials, including 40 kilometres of pipe, for the Trans Mountain expansion project. While Ms. Notley had earlier this month said project construction will begin in July, it now looks like the start date will be in August. At the same news conference on Friday, Mr. Anderson said actual construction on the pipeline will begin in Alberta on Aug. 25, and in the North Thompson region of British Columbia about a month after that. The work this year will be focused on preparing the right of way, which also includes surveying for traditional Indigenous medicines and artifacts along the route. Actual pipe will be put in the ground in January and February. Facing intense environmental and political opposition to the expansion project, Kinder Morgan’s U.S. parent company threatened early this year to walk away from the project. The firm’s ultimatum pushed Ottawa to agree to purchase the existing Trans Mountain pipeline and the expansion project. The federal Liberals, along with Alberta, argue that the project is both safe and in the country’s economic interest. And to make sure Canada’s first major conduit to sell oil in global markets is actually constructed, Ottawa had to take control. However, the project still faces First Nation legal challenges, as well as opposition from the NDP-led government in B.C. that says increased oil-tanker traffic could result in a major spill. Mr. Sohi reiterated on Friday that the government doesn’t want to hold the pipeline asset for long, and is looking for an appropriate buyer. (At this moment, Kinder Morgan still owns Trans Mountain. Although the federal government has said the $4.5-billion sale would close in August, Mr. Anderson said on Friday that the earliest the deal can close is September − after a shareholders vote on the terms. Completion of the deal could be pushed as far as October). Mr. Morin suggested that his First Nation would be interested in joining other Indigenous leaders who want to make a direct investment in the pipeline expansion project. Chief Jim Boucher of the Fort McKay First Nation in northern Alberta – whose lands are surrounded by oil-sands projects – is one of the leaders working to build support for investment by Alberta and B.C. Indigenous communities.